Increased drought severity is expected in the Mediterranean Basin over the twenty-first century, but our understanding of the potential of most forest tree species to cope with it remains uncertain. In this study, (1) we examined the potential effects of long-term selection and the capacity to respond to future changes in selective pressures in three populations of cork oak (Quercus suber L.). For this purpose, we evaluated the response to dry conditions of 45 open-pollinated trees originating from populations in Morocco, Portugal, and Spain. Growth, leaf size, specific leaf area (SLA), carbon isotope discrimination (Δ13C), leaf nitrogen content (Nmass), and total chlorophyll content (Chlmass) were measured in 9-year-old plants. (2) We also investigated the relationships between functional traits and aboveground growth by regression models. Plants presenting larger and more sclerophyllous leaves (low SLA and high leaf thickness) exhibited higher growths, with results suggesting that these traits are subjected to divergent selection in this species. 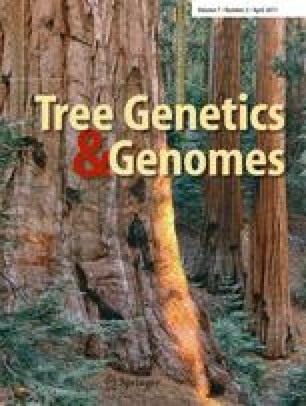 Heritability estimates were moderately high for Δ13C (0.43 ± 0.25–0.83 ± 0.31) and stem diameter (0.40 ± 0.15–0.71 ± 0.28) for the tree populations. For the rest of the traits (except for annual growth), heritability values varied among populations, particularly for height, leaf size, leaf thickness, and Nmass. Our results suggest that natural selection has led to local adaptations and has also affected the genetic variance intrapopulation in these cork oak populations, although studies with a higher number of populations should be carried out across different years. Additionally, the absence of significant genetic correlations and the fact that correlated traits did not undergo opposing selection provided little evidence for constraints on evolution caused by genetic correlations. The online version of this article (doi: 10.1007/s11295-010-0331-9) contains supplementary material, which is available to authorized users. We are grateful to Pedro Fernández, Laura Castro, Regina Chambel, José María Climent, Pilar Jiménez, and everyone from the Forestry School of Madrid who collaborated in the setting up of the cork oak common gardens under the EU-concerted action on cork oak, FAIR I CT 95 0202. We would also like to thank Salustiano Iglesias and the DGB for the maintenance of the assays, and Ricardo Alía for a previous review of the draft and his helpful comments. We thank Matthew Robson who made a thorough review of the English version and contributed with valuable suggestions. This work was funded by the Spanish Ministry of Science (PLASTOFOR, AGL-00536/FOR and BOSALIM, and CGL2007-66066-C04-02 and CGL2007-66066-C04-03 projects). This study was also supported by a MEC-FPI fellowship (BES-2005-7573) to JARV.